"Why use bottled blue cheese dressing when homemade is so quick and easy?" Place garlic cloves on a baking sheet and drizzle with olive oil. Roast in the preheated oven until golden and soft, stirring once halfway through, 20 to 25 minutes. Remove from oven and smash each clove with a rolling pin, meat tenderizer, or bottom of a glass. Chop smashed garlic finely. 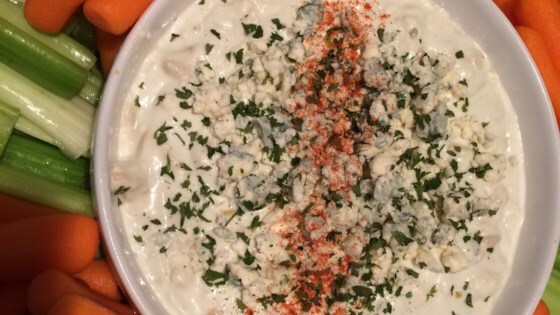 Combine garlic, 1 cup blue cheese crumbles, sour cream, mayonnaise, and lemon juice in a bowl; mix thoroughly. Fold in remaining blue cheese crumbles gently. This is a great recipe. However, I recommend using what you make because after 3 days it becomes runny. It's still very good but, runny. I made this but use 30 TOES (individual pods) of garlic. I added cilantro and parsley. VERY yummy recipe!! !